One thing most online business people dread about running their business is keeping up with the marketing to ensure a steady stream of leads and customers. It's a time-consuming process and knowing how and where to concentrate your marketing efforts isn't always easy. The good news is that marketing your site could become a whole lot easier — with marketing templates. 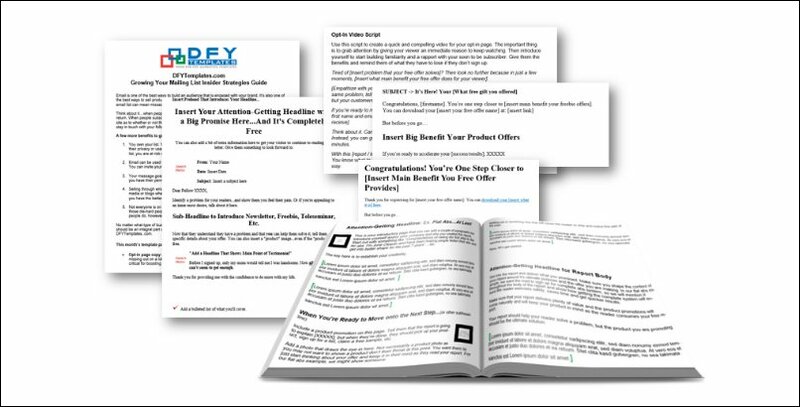 Online marketing veterans, Ron Douglas and Alice Seba, have just announced the launch of DFYTemplates where you get a new package of marketing templates and insider strategies each and every month. These marketing templates and strategies are based on Ron and Alice's nearly 30 years of combined online marketing experience and intelligence. These successful entrepreneurs know what it takes to grow a business. Ron has sold over 1.5 million books and Alice is a noted content marketing expert who has sold millions of dollars in content. When these two talk, I definitely listen and know being able to tap into their stash of marketing tools…that's priceless! Imagine, you get new templates each month to help you master a new marketing strategy each month and to ensure you market your business consistently. Marketing consistently is where most people fail. They start out strong, but then lose steam and their audience and sales fail to grow. A charter membership is over 40% off for just a few days only… a great price for getting this much help. Visit DFYTemplates marketing templates for full details and to get in quickly. No more excuses…you now have the tools to make quick work of growing your business. I'm in too…see you there! Will Your Affiliate Marketing Strategy Stand the Test of Time?